I have a few questions for you . How do you focus on one project? When you do focus, do you stay with a project until you finish it? How many projects do you have going right now? I’m asking these questions because I found Finish it Friday at http://alifefulloflaughter.com. This delightful lady has a great plan and I sincerely plan to follow her. I know right off of the top of my head I have 2 projects going. 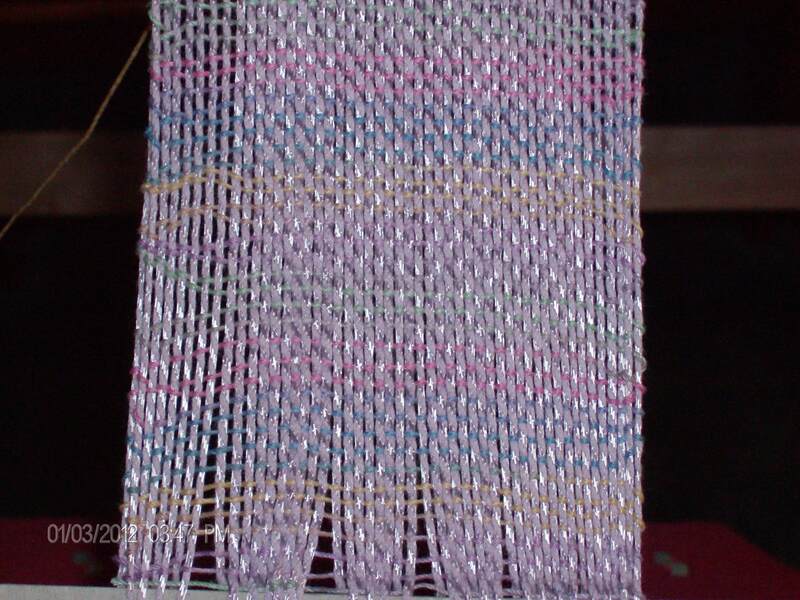 On my Rigid Heddle loom I have my first project done with crocheting cotton. It’s very pretty and I love the weight so looking for more ideas for this cotton is high on my list. Maybe this will be the project I try to finish for tomorrow. This may need some adjusting. Interesting how the picture really shows the weave. Hmmmm. 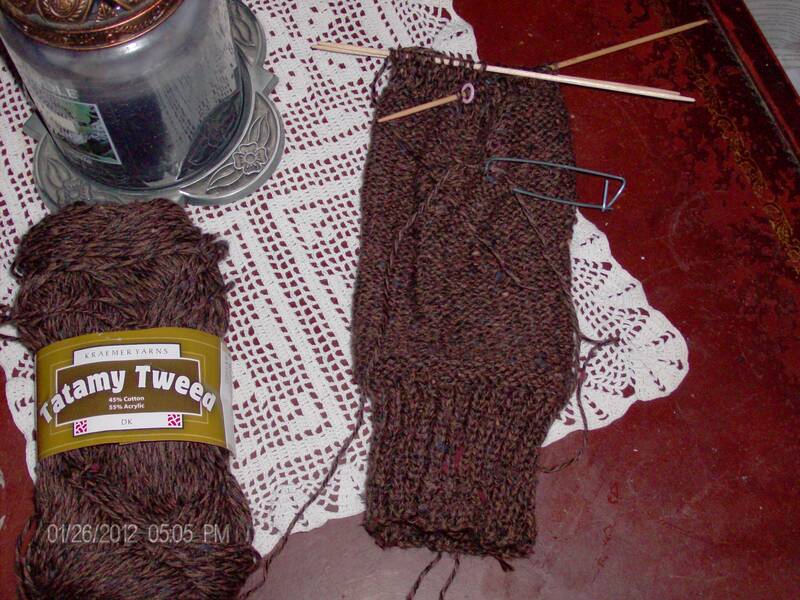 The second project is the brown cotton/acrylic fingerless mitts I’m making for my son. I’ve almost finished the first one and in all honesty I don’t think that I could finish the other by tomorrow unless I’m not working. Sadly, my day job gets in my way. I really like the Kraemer Tamany Tweed yarn. I also have it in a cream color that works up beautifully. Very comfy. I might just have to make a vest or sweater out of it. There’s another project just waiting to be started. Oh, my. 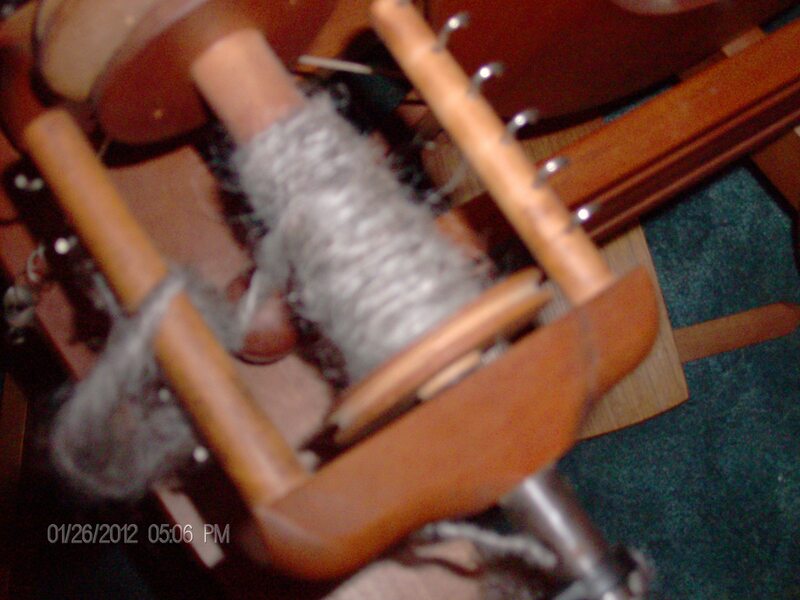 Last and certainly not least, I have the Romney roving to spin. This is my own personal little Catch-22. I’m not very good at spinning so I don’t spin often and I’m not very good at spinning because I don’t spin often. I’m still trying to map out my scheduling with all of the new things I’ve decided I just HAVE to do and it’s a slow trip. If I could just set a 1/2 hour a day aside for spinning I’d be doing much better at it. Wish I had more time in my day, baby steps are just taking too long. So, how do you focus on your projects, whatever they may be, to get you to the end result? I mostly do one project at a time and I set a time to do it.